"Who are you? Where are you? How are you?" Over the holiday, I was visiting my mother on the upper east side of Manhattan. To get to her place from the subway I needed to cross 86th Street at 3rd Avenue. I've been crossing that street since I was 5 years old, it's a horribly crowded corner. On the east side of the street are public and private bus stops. On the west side are numerous retail shops and a movie theater, and at the corner is the famous Papaya King hot dog stand which attracts hungry cab drivers pulling over in front all day long. And 3rd avenue itself is a heavy traffic avenue, as cars are heading uptown and out of the Manhattan. The rhythm of NYC is such that we need to keep moving and in motion; as a result, waiting to cross a street by standing at the curb is not enough, we must walk into the street to get going or keep our momentum. As a result, it can get dangerous, particularly on a busy corner like 86th/3rd, where cars are also pulling over right at that very curb. There are a few ways a city could handle this - put a full time traffic cop there or hand out prodigious tickets, all in an attempt at changing the behavior, but all also likely to upset some people because they are relatively aggressive moves. But the city here didn't do that - instead it simply extended the curb. 1 or 2 days of work, and the problem of the danger to pedestrians on a busy corner is significantly reduced. Small solution which solves a big problem, in a pleasant way. A few years ago I was down in New Orleans and I met some of the local entrepreneurial community - start up types, developers, investors. They were trying to solidify their small but growing community. They told me how that day they had met with a local councilperson about ways to help grow this community. She offered them a package of tax breaks and advantages to help them financially. They told me how they thanked her, but what they really needed, what mattered much more than tax breaks, was simply a dedicated bike path from the area to the east of the French Quarter, where startup companies were moving into cheap and often previously abandoned warehouses, across the Quarter and into to the main business district, where they often had to go to meet with investors. Build that, he said to her, because we need easy, fast and inexpensive ways to get over there with our bikes. A small way to solve a bigger issue for them than taxes. Last week, I met a great entrepreneur with a growing mobile service that is early in its life. Being early, they are still figuring out the best market fit, but due to the nature of the service, at this stage the power users actually drown out new users. Their usage gets in the way of newbies coming onto service and having a great, first experience. In trying to solve this, he first implemented a very large friction and roadblock solution - the heavy users had to pay for their usage. But that was problematic: the service gets better with more overall usage. He'll pull that paywall out - he told me he is now going to experiment with a bunch of small things, maybe simply asking the heavy users to basically slow it down. Small changes. Here's the thing about why small things matter - even the choice of simple words becomes important. 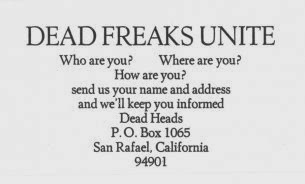 In collecting names and addresses this way, an ask of time and commitment of the Freaks, what always struck me from even when I was a kid up until now, was these three words they included: "How are you?" Imagine that, your favorite band, company, friend, service, asking you how *you* were. 3 small words, and a huge, lasting movement was ignited. Small is not the opposite of big, it actually creates the large.